While I quickly discovered this amazing way to relax – remember I grew up in Midwest, USA – I had NO idea how taking my daughter with special needs would be beneficial to her as well. And to be honest, living overseas makes it difficult sometimes to find therapies for our TCKs with special needs. So, I love it when I can do things that I know are beneficial and inexpensive. 1. Digging in the sand – She uses both fine and gross motor skills as she digs holes and her sandpit is HUGE. 2. Filling buckets – with the sand that she just got from digging holes and also the countless trips back and forth to fill up the buckets with water to pour into the holes. 3. Sand – Just the texture of the sand itself is therapeutic. Many kids don’t like it, so they have to be introduced to it over and over – but others, like my daughter, LOVE it. For us, we had to teach her that it was not okay to put it in her mouth. 4. Running/walking in the sand – If you’ve ever tried running on the beach yourself, you know the workout you can get from it. Enough said. 6. Jumping the waves – I know our PT has worked with us on getting Jie Jie to jump and this is a fun way to jump over something. 7. Collecting shells – We can work on balance as she bends over to pick up the shells and walking without dropping the shells out of the bucket. 8. Playing with the hermit crabs -Jie JIe is an animal lover, and last month her younger sister introduced her to hermit crabs. She loves picking them up and letting them scurry across her hand or trying to scare me with them. 9. 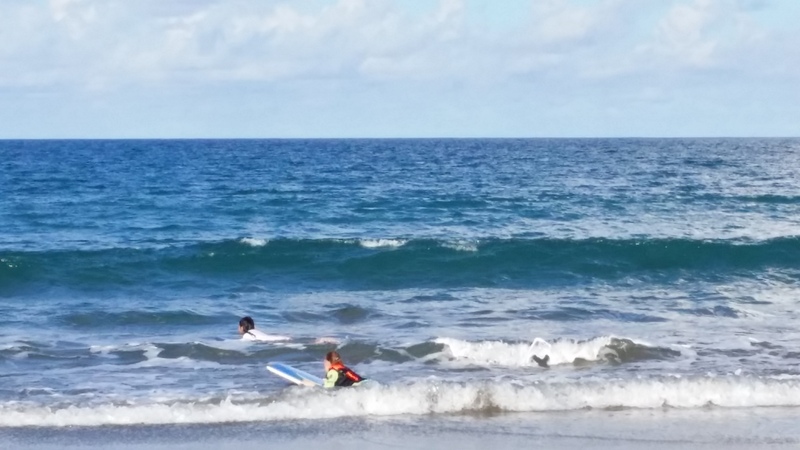 Boogie boarding – My daughter is not able to do this completely on her own, but she loves to lay on the board and let the waves take her in and out. We also go out with her sometimes and help her catch a wave that is a bit farther out. 10. Surfing – I’ve not had the opportunity to do this, but from reading about Surfer’s Healing, it is something I’d love for her to experience. 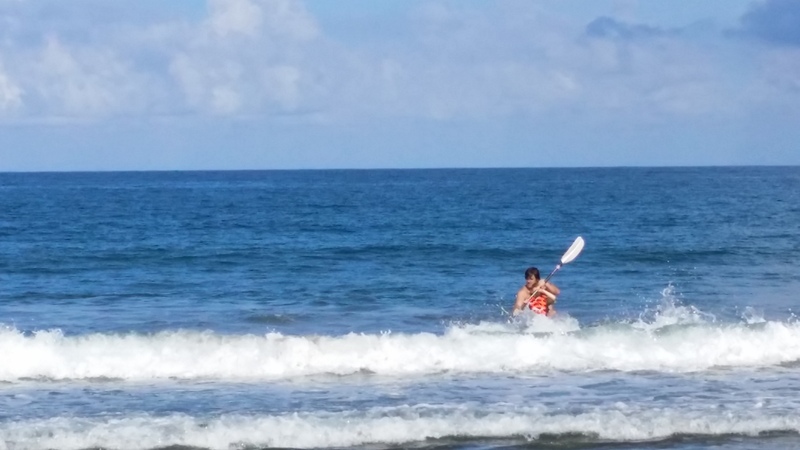 Below is a picture of her out in the kayak with her dad – this girl loves the beach. We’ve just moved to a new city, finally – but transition is rough. I think tomorrow we are in need of some therapy….beach therapy. * Always be extra careful when taking your child with special needs out into the ocean. We always have Jie Jie wear a life-vest even when the water seems calm. Your Turn: What are some activities that you have found therapeutic to you and has been good for your children as well? Please share below. 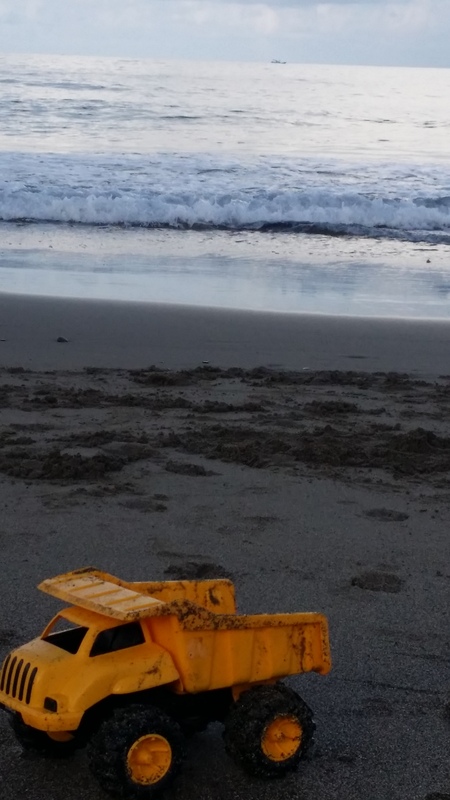 This entry was posted in Parenting, Special Needs, Uncategorized and tagged beach, beach therapy by MaDonna. Bookmark the permalink. Wow Jie Jie is getting so much out of this. What a blessing!